My instructor, Gwen Bernacker did a nice job teaching myself and about 8 other students the technique of Keum boo. 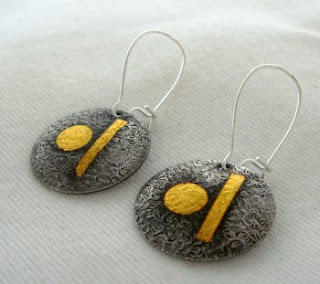 I have posted a picture of the earrings I created. I must say, I am happy with them. It is not all of the time that I am excited about the very first piece of make of a new technique. I have a very small, simple kiln being shipped to me so that I will be able to put old on EVERYTHING:) Well I would not go that far with the gold prices the way they are, but at least on stuff until my gold foil runs out. Talk about recycling??? Having a kiln also means that I will be able to do PMC which is exciting. I also purchased a book from an artist I met at the show, Katie McKinnon. What a nice lady and her book is just great. Just started reading it today. What a great resource for metal clay. There is really no limit to what you can make out of PMC, that is why it is so exciting!